We have to express what a tremendous journey we have had building our home with you. As we reflect back to the process, we find that what we remember is your promptness, your keen communication, and your ability to build us a home that is perfect for your family. Your business integrity is incredible -- the sub-contractors you have chosen to do business with were all so professional and concentrated on quality. Thank you for creating such a beautiful place for us to live!! Thank you for making the process of building our new home and life together, as wonderful as your family and business was to be with. It was a joy to work with all of you! "They always did what they said they were going to do and on time," reported Gina McLean, who along with her husband built a home near rural Holt in Clay County. "We closed two weeks early instead of two weeks late, which happens a lot of times. They are simply wonderful. Everything goes smoothly with them." "We built out in the country, which can cost more", she said. "Rudy took our ideas and revised them so they saved us money and still provided what we wanted. He even checked into things like buying our water meter, which you have to do in a rural area. He made us aware of any extra charges so they weren't a surprise as they came due." Home buyers Stephanie and Scott Staatz also noted the company's ability to meet deadlines. "They were right on time," Scott Staatz said. "We moved in exactly the day we wanted to move in. It was fantastic. A lot of builders seem to let the subcontractors do the work and they just let the project happen. Jacobs was here and always asking what we wanted. We really thought, 'We got lucky!' We've seen other builders who are not nearly as conscientious." 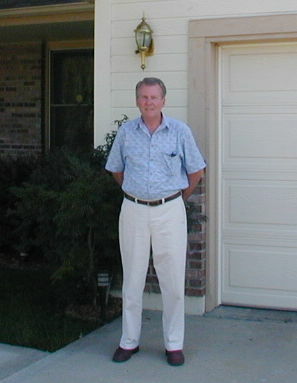 Homeowner Tom A. Kelly was so pleased with his Jacobs home he even contacted the Better Business Bureau. "They just did a complete hands-on with the house from the start to the finish," Kelly recalled. "There was a date I had in mind. And he was always right on hand and right on schedule. Everything I wanted done was taken care of." Kelly said a minor change during the final check was typical. "There was only one hit on the final and it was taken care of before he got out the door," Kelly said. "And he put in a special window himself so it would be just like I wanted it." Kelly said he has no problem recommending Jacobs. "I still keep a stack of his cards in case a friend needs a builder," he said. "The quality of work is just exceptional. There was nothing that didn't meet the highest standards."